Be creative with your clown creations! Applying clown makeup doesn't have to be the challenging process it may seem to be at first. The clown is one of the most popular costume choices out there, but fortunately there are many variations of the look. This makes it easy for both novices and experts to try their hand at the funny business of becoming a clown! You may want to throw on an old t-shirt or smock prior to applying clown makeup. This is helpful because grease paint does tend to be quite wet and, of course, quite greasy when it is first applied. Emulating the look of a traditional clown is easy enough to achieve in the comfort of your own home. Utilizing a few simple tricks, your face can be virtually unrecognizable within just a few minutes! Get started by washing your face and drying it thoroughly. Working on clean skin is important; it provides a fresh, bare canvas that makes makeup application much easier. It's also helpful to remember that clown makeup is naturally exaggerated; there's no room for timidity here! Be bold and dramatic in applying your makeup for the most authentic clown look possible. Apply the white grease paint over the face. 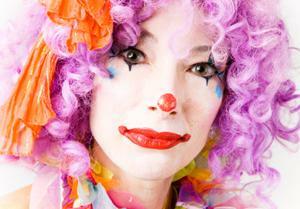 Some clowns call for white makeup only on specific areas, such as around the mouth and over the eyebrows. Others spread the makeup liberally all over the face, ensuring that no bare skin is visible. Dip a makeup brush into the red grease paint and paint a strong, exaggerated shape over and around the lips, on the cheeks and on the nose. Use clown images and your own natural smile as a guide; the outline should extend beyond your smile and often dips down the chin to suggest a wide, goofy grin. The black grease paint may then be used to create the eyebrow area (again, creating an exaggerated shape is recommended, such as half moon shapes that extend above the natural brow). In order to diminish the natural greasiness of the paints, many experienced clowns use the old powdery sock trick. Simply fill a tube sock with talcum powder (or cornstarch), knot it up tightly and proceed to pat it firmly against your face. This will set the makeup and dry the grease at once. Dust off the excess talcum or cornstarch with a large brush or towel. Finish with a spritz of water to seal the makeup in place for the day. As mentioned, not all clowns look the same! You have plenty of room for creativity, so be liberal and imaginative when creating your special character. Don't shy away from using many colors. Look to films (such as horror movies) for inspiration, and browse through images of clowns to glean ideas for your own costume. Clown noses are optional, but not necessary. The nose can easily be painted on with red grease paint, but many individuals prefer the playfulness of the actual nose. Small props like these, as well as wigs and actual clothing, can be quite effective in helping convey the authenticity of your costume. Bear in mind that decent costumes can be costly, but basic attire for Halloween night should not cost you an arm and a leg. Practice your makeup beforehand. If you begin at least a week prior to the event, you'll be able to create your look flawlessly when the day arrives. You'll also have more time to experiment with various clown personas to determine which is best for you. Take photographs of the various looks and show them to unbiased individuals; you'll enjoy great success with your look if you can utilize some constructive criticism ahead of time!